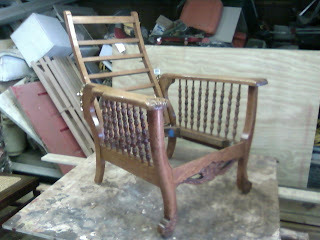 Here are a few photos of the Morris chair I have been working on after it has been restored. 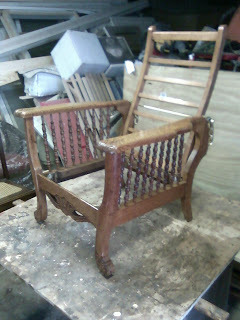 The replacement hardware has been installed and the next step is to have the cushions made. 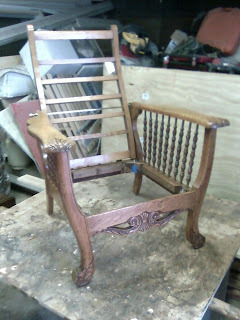 I will post photos of the chair after it has returned from the upholsterer. Hi, I am looking for a source for a replacement hinge which fits at the base of the seat and is the mechanism which lets the back change angle. 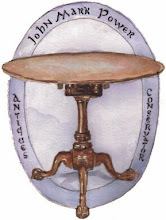 There are two on the chair I bought, one lacks the portion which is the pin side of the hinge. I think it will need to be replaced as I don't know how to find just the pin half-welcome any leads-most of the sources I have found on line are not specific as to this part or how to get a new one. lynneweeks@aol.com thanks! !